Since I was 18, I’ve gotten migraines. I don’t know why they started, but they decided they liked me and have stayed ever since. Nowadays, my migraines are at least a little more predictable – Chinook winds, sometimes if it’s threatening to rain or snow, bad stress, constant irritating noises, PMS – and I can usually dodge a bullet here and there, or at least know that once the rain starts my migraine will stop. The problem lately is because my work has been going through renovations, that means lots of loud noise and stress combined. Needless to say I’ve looked like this most of my last few workdays. Luckily for me, everyone at work understands my migraine situation and doesn’t begrudge me looking like an antisocial brat. I’m pretty sure today though I almost hit my breaking point: for a good half hour or more someone relentlessly banged on something metal with something that sounded like a mallet, and it all reverberated all the way up to my office. Le sigh. I chose a bluebell lace pattern from an old knitting book of mine, whose name always escapes me whenever it’s not in site. 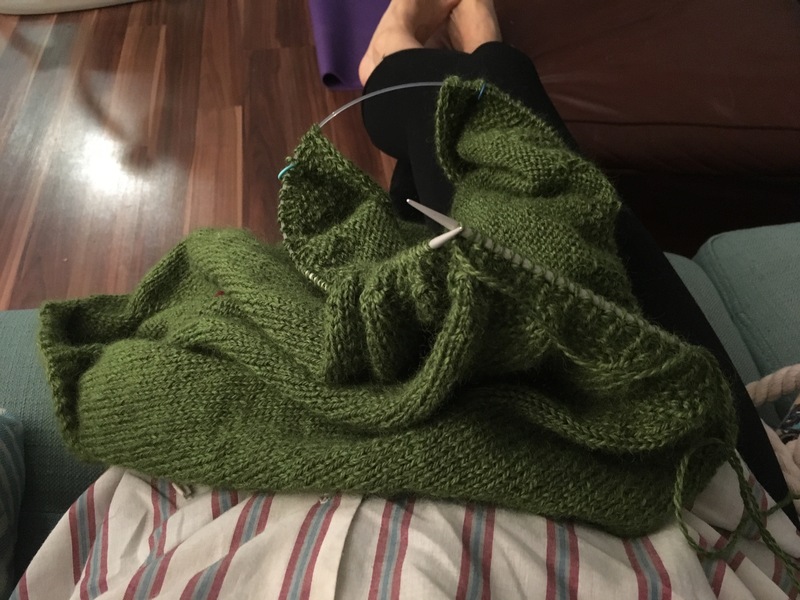 I thought they were appropriate because of the yarn colour, although I forgot to take into account that because it’s a top down sweater, that then means the lace will be upside down….Oh well, I’ve always liked arrow heads.